You have witnessed Acharya and I turning into light, bilocating, and appearing at will in the dreams of hundreds of our followers. These events are not random. Whenever two or more dimensions begin to merge, the energy of the higher dimension introduces itself into that of the lower dimension. The energy of the Fifth Celestial World has begun to manifest in this world. The miracles mean that the energy of higher beings is starting to manifest in this world. For the first time in hundreds of years, we have been given a real taste of juice. Certain individuals have been chosen by the Celestial World to carry this energy into this lower world. As a result, they have been and will continue to be blessed with miraculous power. Know however, that the power does not come from us, it comes from a Higher Source. A number of Celestial Beings, including The Archangel Zythurdreane and The Archangel Zagzagel have informed us that they wish to do more than peer into this world with the occasional miracle. They wish to anchor a portion of themselves into this world through a vessel. This vessel will allow our world to hold a great deal more of the power of the higher celestial worlds. As a result, miracles, healings, consciousness expansion, enlightenment, and joy will spread throughout our dimension. Much of the power that Acharya and I have in this world derives from the Celestial World. Our Celestial Archangelic being strengthend our mind, body, and soul energy so that we may lead others. 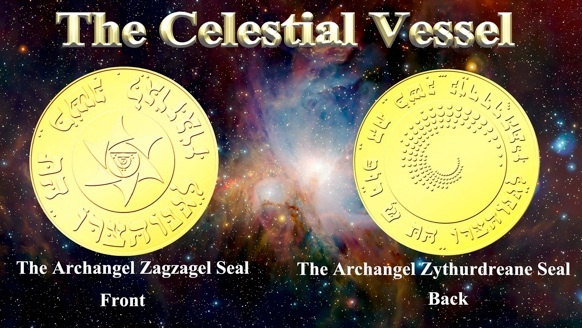 The Celestial Vessel will be released to 25 individuals. These individuals will receive a portion of the Archangelic Soul from both Zythurdreane and Zagzagel. In exchange, this new soul energy will serve as an anchor for the merging of the higher celestial world and this world. These individuals will choose themselves through the purchase of the Vessel. The Vessel will receive a continuous stream of Celestial Power from the Higher Worlds. In other words, it will continually recharge itself in accordance with certain planetary movements that correspond with celestial events. It is a 3.25 inch diameter medallion. It is covered in 24 carat gold and is imbued with the seals of Zagzagel and Zythurdreane. Zagzagel’s seal is on the front. Zythurdreane’s seal is on the back. Contrary to our older medallions, these Vessels have been minted in a special process that makes them a high power entity. They have not been die-struck, die-cast, or enamel coated. They are newly minted, gold covered vessels of power. The owners of these Vessels will enjoy greatly increased miracles, such as the ones we have seen and more. They will also grow spiritually a little faster than the rest of us, but this is necessary so that their energies will light the way. This is a precious time for us. We have been granted the power and ability to lead the way for a sleeping world. The Vessel will help to awaken many. We have made a considerable investment in the creation of these Vessels. At this time we can only offer 25.